Often perceived as an elitist and superficial industry, the lawyers who come to the defense of fashion get a bad rap. After all, why should anyone care about protecting huge fashion and luxury goods conglomerates like Hermès from online retailers selling fake Birkin bags? The answer is simple: the law of fashion doesn’t only exist to protect the designers, it’s there to protect you, the consumer. Fashion law is a broad category that covers everything from employment issues to mergers and acquisitions. However, most of the rhetoric surrounding fashion law focuses on protecting a brand’s trademark. So what does that mean, and why is it important to you? According to the United States Patent and Trademark Office, a trademark is “any word, name, symbol, device, or any combination, used or intended to be used to identify and distinguish the goods/services of one seller or provider from those of others, and to indicate the source of the goods/services.” So, a trademark can be anything from a logo like the Nike “swoosh” to the red sole on the heel of a Louboutin, so long as its purpose is to provide a signal to the consumer about what brand is responsible for the product they are buying. This is important because, as consumers, we base a lot of our decision on which products to buy in which brand created them. The brand of a product carries with it expectations of a certain level of quality according to our past experience. Think back to the last time you were at the grocery store. Did you decide to buy name brand paper towels or the generic brand? You can’t test each package of paper towels in the store, so how would you know one might be superior to another? Maybe you have tried both kinds and have concluded that the name brand is a higher quality product. The next time you need paper towels you are more likely to choose that brand because your past experience has led you to expect a certain level of quality from that product. This is called brand loyalty. Brand loyalty exists in the fashion industry all the way from runway couture to your everyday attire. Think about your favorite pair of jeans that fit like a glove. When it’s time for a new pair, that’s probably the brand you seek out at the department store. You expect them to fit, feel, and last as long as your old ones. In an industry like fashion where your options are seemingly limitless, when we find a brand that seems to fit our shape, style, and budget, we reward that company with our loyalty. Ideally, if enough people buy the clothes, the brand recognizes the demand and keeps producing outfits that you love. Everyone wins! Now imagine that when you get to the grocery store, both the name brand and the generic paper towels have almost indistinguishable packaging. If you accidentally choose the generic brand, you may be frustrated with the inferior quality of product that you received. Believing you purchased the name brand, you might decide that their product is no longer living up to your expectations, and decide that the next time you need paper towels you will choose a different brand altogether. In this scenario, the generic brand took advantage of the name brand’s good reputation by tricking the consumer into purchasing it, and in the process destroyed that consumer’s brand loyalty. And now you, as the consumer, wasted your money on a product that you did not intend to buy. This same concept can be true beyond household cleaning products and especially in the fashion industry. Consumers want to be able to make decisions about a brand based on their experiences with it, but if they are confused about which brand they are purchasing that becomes impossible. If a company is selling handbags by tricking consumers into thinking they are buying a designer bag rather than by creating their own brand loyalty, the biggest loss falls on the consumer, who chose to spend his or her money expecting a product of a certain quality and received a knockoff instead. Ultimately, protecting the trademark of a brand protects that company from others trying to profit off their good reputation, but it also protects your ability as the consumer to make an informed purchase. On the surface, fashion law might seem like nothing more than a hobby for attorneys who keep the latest issue of Vogue hidden beneath the Wall Street Journal on their desks. After a closer look, however, it is clear that by protecting trademarks we encourage companies to take responsibility for their products. This means a company must learn to distinguish itself by producing higher quality goods rather than leaning on a competitor’s hard earned reputation. This means that you, as the consumer, get to reap the benefits of companies trying to win your loyalty by producing better quality products. 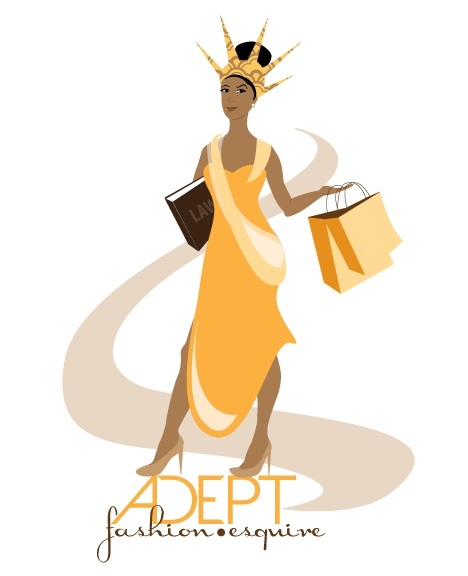 Fashion Law Society--3rd Annual Fashion & Design Law Symposium! 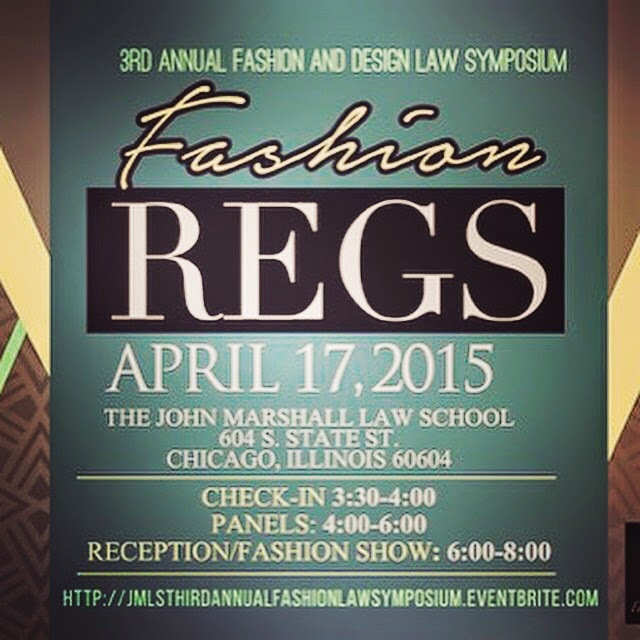 John Marshall Law School always puts on a great Fashion Law Symposium. This year will be no different. 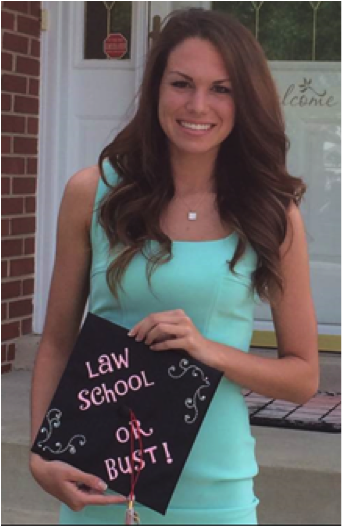 Not only will there be various panels from knowledgeable lawyers, but a fashion show and fabulous social hour. Don't miss out on this great event. Chicago fashion law is here to stay!